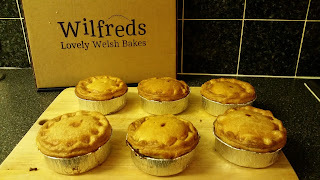 Pierate - Pie Reviews: Will I enjoy Wilfreds Pies? 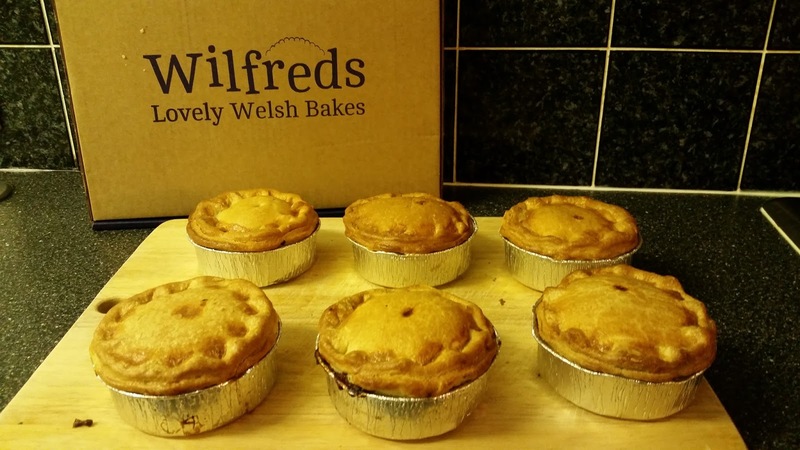 One of the delights of British Pie Week is getting a whole host of pie deliveries throughout the course of the week, and I was eagerly looking forward to the delivery of the new premium range of Lewis Pies, known as the “Wilfreds Pie Range”. Based in Swansea, Lewis Pies are one of the largest pie manufacturers in the UK with over 100 full time staff and have been trading for 80 years now. They have found the Fiery Chicken (Cajun Chicken and Collier’s Welsh Cheese) and Saucy Cow (Steak and Gower Ale) are their best sellers but how would they all rate on the 7 Cs of pie rating? Firstly an overall impression of the pies. Upon opening the box I was delighted to see a nice range of flavours and local welsh ingredients being used in the pies, including welsh cheese and Gower ale. They’re made with hot water crust pastry, which makes them stand out from the typical shortcrust and puff pastry used in a lot of pies. It was in general a nice pastry to eat, a little thick in places for the size of pie but holding together well and easily hand held. There was naturally some crumbling when cut through but this is to be expected from a crisper pastry casing. It’s also worth noting that while the pies retail individually at between £2 and £2.50 at the various butchers and cafes they are sold at, you can get the box of 6 pies for just £7.50, which means an incredible £1.25 per pie! Bargain! It was noticeable from all the pies that they weren’t as big and packed with filling as I’d hoped, which meant there wasn’t the perfect filling:pastry ratio I’d love to have. However considering the price of these pies I couldn’t expect much more filling in them to still be financially viable as a business! For a premium range I would personally prefer to pay a bit more for the pies and get them a bit better filled, like the majority of our highest rated pies on Pierate. But for the price they are retailing at, they are a very good option. 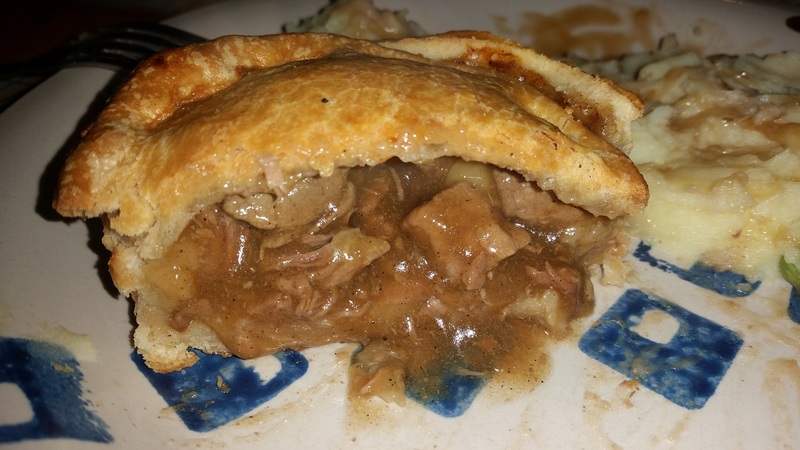 The filling in this pie was nice, with a good tender lamb filling and complimentary gravy, lightly minted rather than being particularly strong, however I was surprised at the lack of any noticeable vegetable. While the veg in the chicken pie was clear and apparent, it wasn’t so much in the lamb pie. With most lamb pies being quite strongly flavoured with mint (some over-minted to their detriment!) they have perhaps been a little too cautious with their flavouring to the point of it not being quite noticeable enough, particularly with one of the two lamb pies I had not being very minty at all. A bit more lamb and boost of flavour from the other ingredients would promote this pie even more but I’d still recommend it. The meat in the steak and potato pie was very nice and tender, complimenting the delicious potato and gravy content and working well with the crisp hot water crust pastry. The potato couldn’t have been more spot on – neither mushy and indiscernible or too hard and chunky. It was just right! 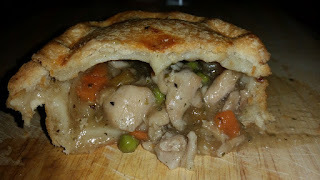 The main downside was a slight lack of meat and potato filling, which would have made the filling:pastry ratio ideal. My favourite of the three and would certainly enjoy again. The chicken was lovely and tender in this pie and the vegetables – peas and carrots – added a nice texture and flavour to the mix. While I quite enjoyed the gravy it was slightly over seasoned, dominating the flavour somewhat but providing a nice moist pie filling. 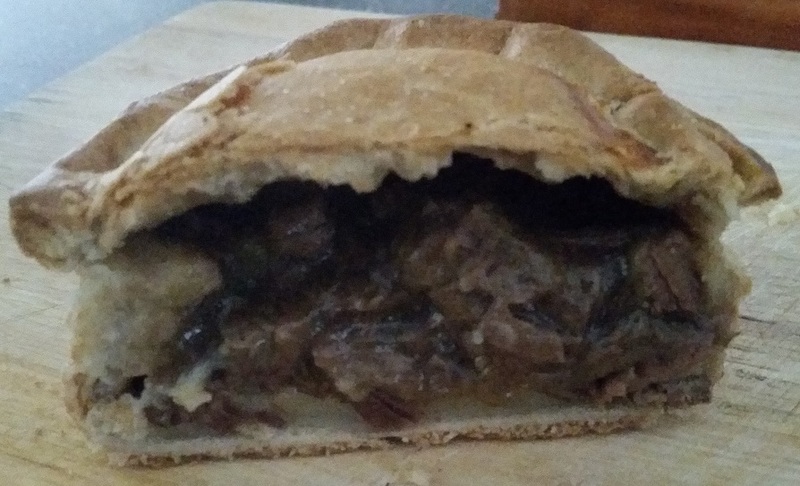 Once again the pie could have done with a bit more filling to balance out the crisp hot water pastry casing but in all another pie I’d recommend. Overall, while at the time I was eating them I admit I was slightly disappointed with the lack of content (especially compared to some of the other pies I’d had recently that were packed to the lid) to subsequently find out these pies can be bought for just £1.25 each in a box of six has made me more sympathetic to their slight lack of filling. As said earlier, I’d personally rather pay nearer £3 for a premium pie and get it packed with filling but overall and for the price they are sold at this is a very impressive new range from Lewis Pies, with 3 more reviews to come. Thanks for sending them!